Windows 8 ‘officially’ launched way back in late October of last year. However, developers and enthusiasts have been using it for much longer, so you’d think there would have been an official Twitter app at launch, right? Nope. Instead we didn’t hear that Twitter was working on an app until the ///BUILD developer conference in Redmond. 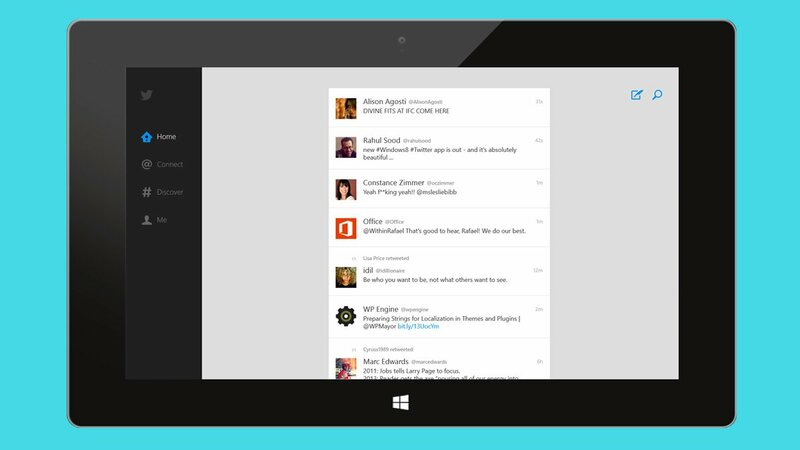 Four months later, we now have Twitter for Windows 8. Why do we need Twitter for Windows 8 when we have great apps like Rowi, MetroTwit, and Tweetro? Mostly because of the token limitations Twitter has placed on future 3rd party app development. Plus it’s a sign of confidence when a major app like Twitter signs onto a platform. Twitter for Windows 8 is fairly spartan in both design and functionality, mostly mimicking the web interface, but with a slight Microsoft Design Language twist. It has all the Windows 8 features you’d want too, like snap view and support for the share charm. Below is a fun promo video of the app, after that let’s dive in and check it out. 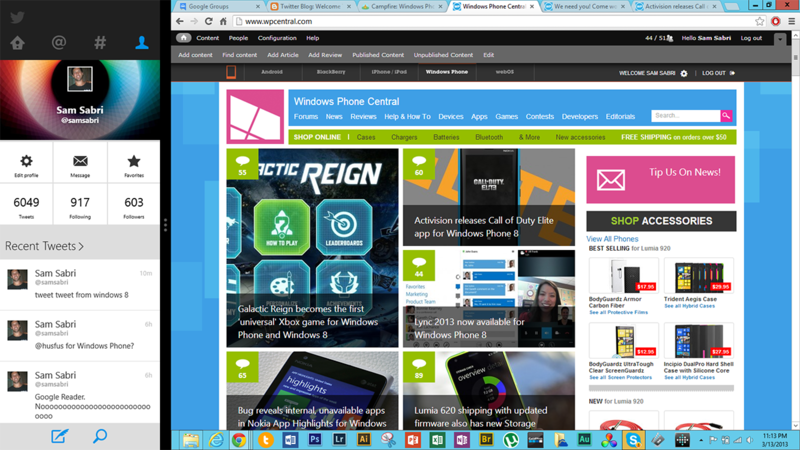 Just like the website and new Windows Phone app. You’re basically given four panes – Home, Connect, Discover, and Me. The app basically feels like they took their new Windows Phone app and tweaked it a bit to look good on larger screens. That’s both good and bad. Good because you get the same interface across all their apps/website and the simple design is enough for most. Bad because you can’t customize it as much as you can with other apps. If you’re a power user, you might be better off sticking to other 3rd party apps, but if you just manage one account and want a basic interface, the Twitter app is just for you. Charms are one major benefit that apps on Windows 8 have as a whole over competing ecosystems. I’m especially referring to the Search and Share charms, both of which are fully supported in Twitter on Windows 8. You can share to Twitter from any app on Windows 8 by using the Share charm. For example you can browse your latest vacation photos, swipe in from the right (or use hotkeys/mouse) and select the Share charm. Type a few words, click send and you’ve shared that photo with your Twitter account. Same goes with the Share charm – pop it up, type in your query, select Twitter and you’re instantly searching using the Twitter app. As expected, you also get Live Tile support and notifications. The Live Tile can be either large or small and will display your latest mentions and interactions. You can also select Twitter to display notifications – both in the top right corner with the pop ups and on your lock screen. Snapping Windows 8 to the side of your screen in Windows 8 is delicious. I’ve only been playing with it for an hour, but it could be my favorite Twitter client so far when snapped to the side. The ‘Me’ section is what really won me over (too narcissistic?) with its layout and presentation. We’ll see how I feel once they honeymoon period is over and I’ve used it for a few days. We’ll be playing with Twitter for Windows 8 and put it up against the current champs for Twitter apps. In a few days we’ll do a mini comparison for you guys, in the meantime check it out for yourself. 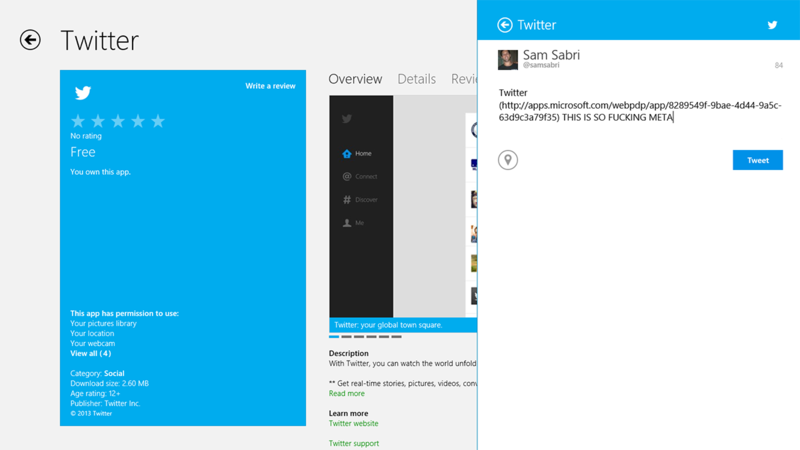 You can download Twitter for Windows 8 (ARM, x86 and x64 devices) in the Windows Store here. Or just open the Store, it’s currently first in the spotlight section. P.S. You should be following the Windows Phone Central team on Twitter. You can get our official account @wpcentral, Daniel Rubino is @Daniel_Rubino, Jay Bennett is @JayTBennett, Rich Edmonds is @RichEdmonds, George Ponder is @Coppertop004, Paul Acevedo is @segacon, Dave Blake is @Big_D5, and yours truly is over at @samsabri.